I don't know what came first in this recipe...the potato or the truffle? 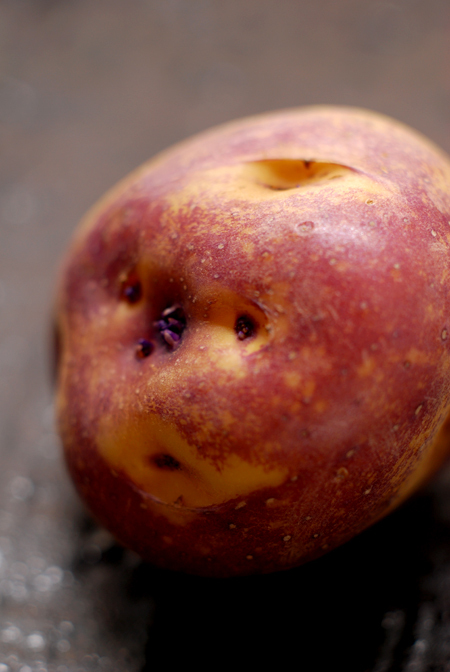 The potatoes in question are these adorable baby pink eyes - pink eyes are best boiled, steamed or baked. 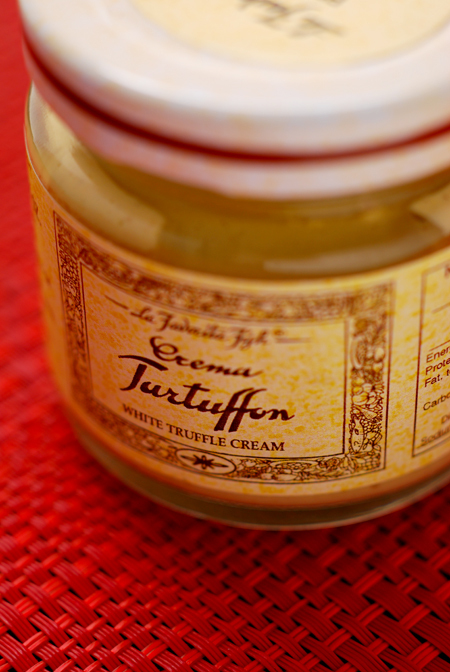 The truffle comes in the form of this White Truffle Cream which unlike many "White Truffle Oils" actually contains real white truffle rather than the chemical 2,4-dithiapentane. It's a simple blend of porcini, olive oil, salt and white truffle. To test how good the truffle cream was, I got Paalo to close his eyes and then waved the open jar under his nose. I don't think I've ever seen him move so quickly or look more happy. Indeed I had to pry the jar from his hands since he just couldn't stop sniffing it! I have mentioned it before but white truffles unlike their black relatives, shouldn't really be cooked and are best used shaved over a dish. For this recipe, a small spoonful is stirred through the finished dish where the heat does it job to release and infuse the ingredients with white truffle goodness. 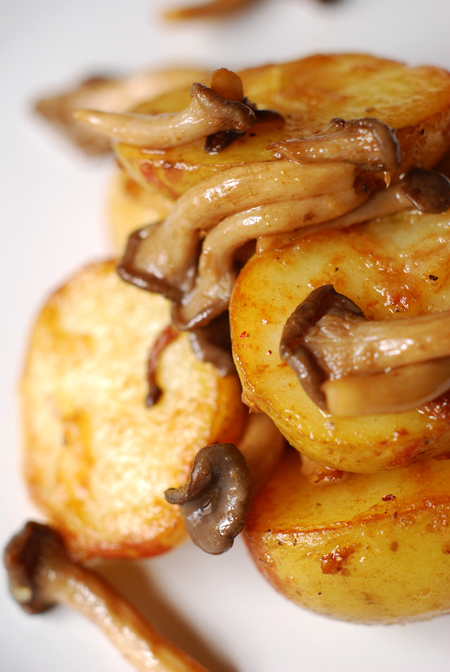 Choose potatoes that are all roughly the same size to even out cooking time. Steam until just tender. Cut them in half when ready to assemble the dish. Heat a little oil and a knob of butter in a skillet over a medium heat and when the butter is melted and sizzling, add in the shimeji. 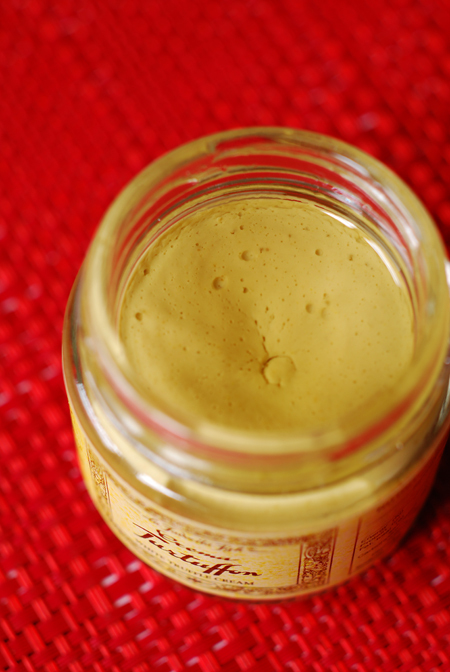 Cook quickly until lightly golden. Remove the shimeji from the pan and add in the halved potatoes - cut side down. Flip when golden and return the shimeji to the pan. Toss for a minute to ensure even colouring before removing the ingredients to a bowl. Take a small spoonful of Truffle Cream and stir through the hot potato/shimeji mixture. It will dissolve in the retained heat. Once mixed through, place in a dish and serve. This is one side dish that I can pretty much guaranteed will disappear as soon as it's placed on the table! I've cooked with truffle oil before, but never truffle cream. Looking at this dish, I think I'll have to track some down. Delightful! I believe you when you say that this disappears fast when placed on the table. I'm drolling....and it's just 10.12am! Speaking of truffles, can you believe that I haven't had any this season. I need to rectify that pronto! Thanks Terry - hope you find some! Thanks Nora - oh dear, you must seek the local truffles out before they run out, if not there's always the Italians coming into season in November.